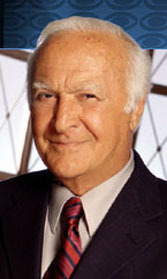 Robert Loggia was a character actor, best known for playing crooks, thugs, and gravelly-voiced cops. He played mobsters in Scarface, Prizzi's Honor, and The Sopranos. His talent for such "tough guy" roles was undeniable, and not entirely acting. Loggia said he beat up his gym teacher in high school. As a young man he pursued a degree in journalism, but when he stepped on stage in a college production of The Taming of the Shrew, he knew he would never be a reporter. He studied at the Actors' Studio in New York, appeared in numerous stage productions there, and had a tiny role in his first movie, Somebody Up There Likes Me, in 1956. He had a much bigger part in his second film, the shocking union drama The Garment Jungle with Lee J. Cobb. He played Joseph -- stepfather of Christ -- in The Greatest Story Ever Told, with Dorothy McGuire as the Virgin Mary. In a 1958 TV series, he starred in The Nine Lives of Elfego Baca, as a lawyer and sheriff in a Disneyfied version of the old west. 16-year-old Annette Funicello had a guest role in a few episodes, and four years later, when Funicello was red hot, Disney re-edited those episodes into the feature film, Elfego Baca: Six Gun Law. His stardom peaked with a 1966 TV action series, with Loggia as the mega-cool acrobat, thief, and bodyguard Thomas Hewitt Edward Cat, or T.H.E. Cat for short. The show was popular with children and teenagers, but the science of measuring demographics had not yet been perfected, so the only numbers the network saw were the total ratings, and those numbers were small so T.H.E. Cat was cancelled after just one season. Loggia worked on a few daytime soap operas, and through the rest of the 1960s and '70s he continued taking character roles in film and television. In the classic An Officer and a Gentleman, he played Richard Gere's alcoholic father, and he appeared in several Pink Panther films. It was Jagged Edge with Glenn Close and Jeff Bridges that gave Loggia's career a second start. Playing a delightfully foul-mouthed private investigator, Loggia got his only nomination for an Oscar. In Big, Loggia played the owner of the toy company where Tom Hanks worked, and they danced together on a giant piano keyboard. In Independence Day he played the General who delivered the bad news, "We could be looking at the worldwide destruction of every major city in the next 36 hours." On TV, he played a wacky Senator on Wild Palms, and did commercials for orange juice.